inner circumference of 22 - 23 inches. 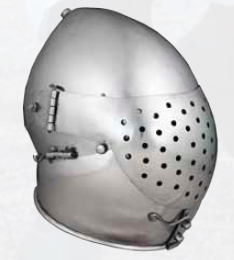 This late 14th century "Dog Face Bascinet" is skillfully constructed of 16 gauge mild steel. The well vented pierced metal visor is completely interchangeable with the grill work visor. This close fitting skull cap design includes fitting for visor mounting and hook closure for the helm. By the mid-14th century it replaced the great helm and was fully visored, often "dog faced" (the conical hounskull visor), often worn without a visor for visibility and 'breathability'. Worn with an aventail then later with a gorget. Visors on English bassinets have a hinge at each side whereas German bassinets have a single hinge attached at the middle. Small rounded pointed skull'Pig-faced' or 'Dog-faced' bascinet developed beginning around 1340's AD. This type was universally popular in north-west Europe in the late 14thC, and this specific type was in use around 1390, and up until about 1420. This page was last modified on 6 November 2013, at 15:30.